Here's the story....I am out running errands for the third time this week with Mason trying to keep him happy as we drive from store to store. Easier said than done. You would think I have a toy box in my car, oh right, that's the floor! As most 2 years olds go, Mason plays with his toys for a few minutes, then moves onto whatever catches his eye. In the meantime, toys, cups, snack traps, etc all end up on the floor. The Kiddie Catch-All may just solve the problem for parents who are constantly turning around (while driving) to give their little screaming sweetie back whatever it was that ended up on the floor. I can now put Mason's favorite toys, cup and snacks all within his reach. Best of all, I can pack the Kiddie Catch-All so that when Mason drops one toy, he has another right at his reach. Like I do at home, I trade out toys about once a week so Mason doesn't get bored. I have also learned that the easiest way to use the Kiddie Catch-All is to make sure it is filled when you start your trip. By the time you get to your destination, chances are, it will be empty. I take a few minutes to restock it before I take Mason out of the car seat. 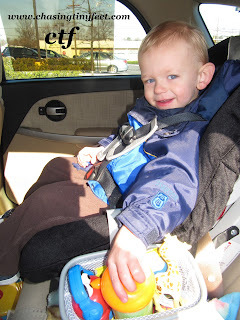 That way I do clean up all at once, not while driving, and the Kiddie Catch-All is ready for the next go around! And it is so easy to use and, more importantly, easy to get Mason to use. The Kiddie Catch-All came with suggested instructions on how successfully get your child to use this product. And it works! Of course, it is age dependent on how well your child follows and understands instruction, but with patience and practice, any child can be taught how to use the Kiddie Catch-All. 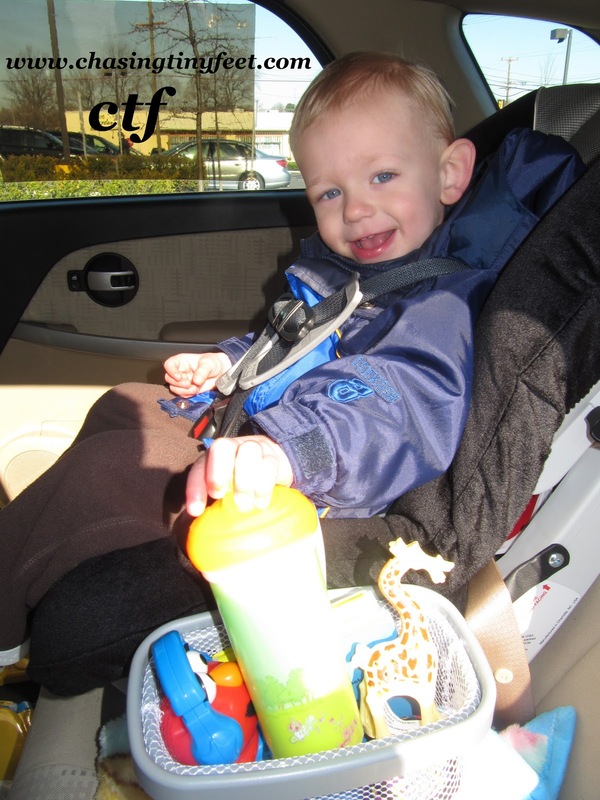 The Kiddie Catch-All fits most car seats or booster seats. 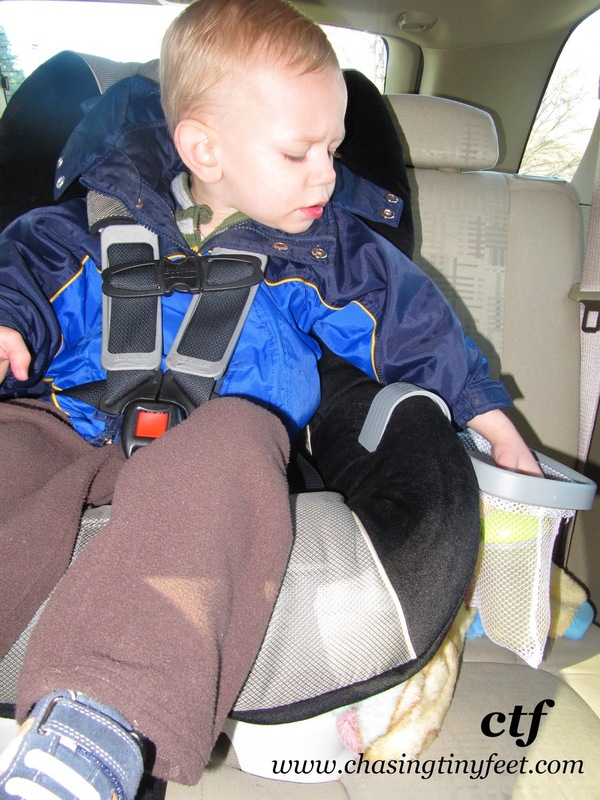 The Kiddie Catch-All will also fit most regular arm rests for children old enough to ride without a booster or car seat. Another nice feature is that if it gets dirty, the sack is easily removable and can be machine washed. Check out kiddiecatchall.com to order yours today. Right now, they are offering a buy one, get one free for only $12.95 (plus S & H). Mama Cheaps provided me with the item above in order to facilitate this review. All opinions are 100% mine.